The McGill University men’s hockey team, which captured their first-ever CIS national title in March, finally received their much-awaited championship rings in an intimate ceremony with family, alumni and a number of their incoming recruits, held at McConnell Arena’s Alumni Lounge, Tuesday. 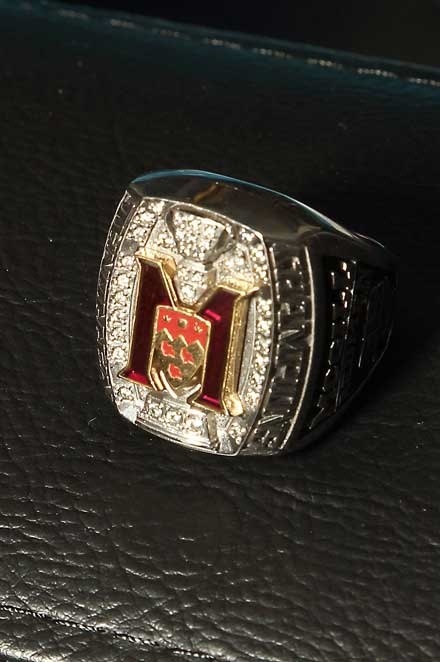 The ring features a ruby red stone with the team’s “M” logo and the McGill University coat-of-arms in red, laced with a gold trim. The M sits on a background of gems designed to look like the University Cup trophy, framed by the words “National Champions” around the perimeter. The sides are black with a silver-coloured Queen’s Cup, representing the OUA league championship captured the week before the CIS tourney. Vossen tallied the Cup-winning marker at 6:00 of sudden-death overtime in a 4-3 win over the Western Mustangs in Fredericton on March 25. It marked the team’s first-ever CIS crown on the 50th anniversary since the national championship was created in 1962. The Redmen, under head coach Kelly Nobes , completed their 136th season with a 32-12-1 record overall, including a league-leading 22-4-2 regular season mark. They won their 17th Queen’s Cup title as champions of the OUA conference, then claimed the CIS University Cup tourney. The team was honoured by the Montreal Canadiens at the Habs-Leafs game on April 7, in addition to being invited by Montreal Mayor Gérald Tremblay to sign the city’s Golden Book, an honour reserved for special guests, on May 16. McGill is expected to lose as many as eight players, including Vossen, who was one of four Redmen to sign a pro contract after the season. The six-foot, 195-pound left-winger inked a pro pact with the ECHL’s Stockton Thunder, joining centre Maxime Langelier-Parent (Norfolk, AHL) and winger Francis Verreault-Paul (Hershey, AHL). Defenceman Marc-André Dorion , the team MVP who won a BLG Award as the CIS athlete of the year, also signed a two-year deal to play for EHC Linz in Austria. The Redmen begin preseason play for the 2012-13 campaign on Sept. 14, when they host Royal Military College. The regular season is slated open on Oct. 5 at Concordia.